There is nothing more uncomfortable than trying to hold back a smile because you don't want others to notice your discolored teeth. Fortunately, there are several teeth whitening options available that can remove or reduce staining on your teeth. Dental porcelain veneers, also known as dental laminates, are thin porcelain shells that are cemented to the front of the teeth. Porcelain veneers are extensively used to correct orthodontic and cosmetic issues. However, for some, veneers are an expensive procedure and require shaving some enamel on the teeth. Teeth whitening is one of the most popular cosmetic dentistry treatments. Many over-the-counter teeth whitening products that are available include: whitening toothpastes, over-the-counter gels, rinses, strips and trays. In-office whitening treatments are a great option. One treatment takes about an hour and can whiten the teeth significantly. Unlike over the counter whitening treatments, in office treatments are quick and they can be done in combination with polishing of the teeth to get better results. For people with sensitive teeth, desensitizer's can be used before and after. In the dentist's office, the whitening solution is applied directly to the teeth while the gums are protected. If the patient has custom trays, stronger bleach can also be used in the patient's tray under the dentist's supervision. Dramatic results can be seen after the first treatment. Take home bleaching trays are also a great option, and the bleach can be purchased at dental offices. The bleach from a dental office has a better formulation, works more predicatively, and causes less sensitivity than over the counter strips. The treatment time for best results is 7-10 days of consecutive use. Then the trays can be used to maintain the whitening anytime the patient wants. Dr. Kashani uses Opalescence bleach which has 10%, 15%, 20%, and 35% formulations depending on the level of sensitivity of the patient. Opalescence has also been shown to strengthen the teeth at the same as it whitens. A Snap-On Smile is an inexpensive way to obtain a beautiful smile. Snap-On Smile is a thin, removable appliance that "snaps on" to your teeth to give you a new smile. Snap-On Smile is not a once-size-fits-all, but is customize to fit your bite and teeth. With a Snap-On Smile, there's no drilling, no adhesive, no invasive dental treatment and it is not permanent. Snap-On Smile can be put on both the upper and lower teeth whenever you want. You can also take it out to brush and floss your teeth as you normally would. Tooth-colored composite fillings are primarily a restorative procedure, but can also provide many of the same benefits as cosmetic dentistry treatments. Composite fillings are made out of a mixture of materials that blend in with the rest of your tooth, creating a natural-looking restoration. They are considered "chair side veneers". One of the big advantages is that composite fillings can be bonded directly to the surface of your tooth, which means they require less drilling and preserve more tooth structure than porcelain veneers. Porcelain crowns are a good cosmetic dentistry solution for teeth that are damaged, misshapen or decayed. Crowns can be used alone or with dental bridges and dental implants. A porcelain dental crown is a tooth-colored "cap" that is placed over a tooth. A crown will improve a tooth's size, shape, strength and appearance. When the porcelain crown is completely in place, it will fully cover the visible portion of a tooth at and above the gum line. Porcelain crowns usually require two appointments. The first appointment is primarily to make a mold of your damaged tooth and the second appointment is to place and polish your custom-made restoration crown. Invisalign is another alternative to veneers. By straightening the teeth most patients get great aesthetic results. Patients who think they need veneers are surprised to see that with Invisalign, some whitening and minor bonding allows them to get their perfect smile. This can often cost less and does not require teeth to be shaved. If you would like to improve your smile, but find veneers to be too costly, call our office to find out which alternative procedures are best for you. 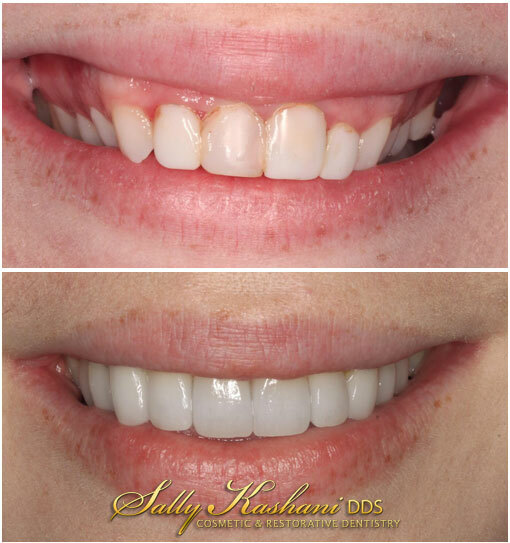 Call (818) 508–7272 today and make an appointment to meet with Dr. Kashani and brighten your smile.